The residential cohousing community is the heart of Living Tree Alliance. 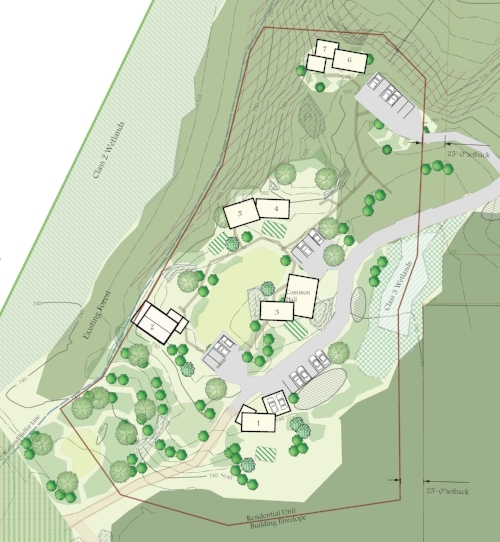 Our approved plan is for seven residences, a common house and workshop on three of our ninety one acres of land. The village design is compact, accessible and ecologically oriented, balancing the dynamics of community engagement with the needs for personal space. The building design and construction is aesthetically inspiring, ecologically responsible and crafted with the help of skilled local tradesfolk. Our residential culture is oriented towards the observance of Jewish traditions, rituals and cycles while maintaining a spiritually inclusive consciousness. Conceptual plan for cohousing village. There are only 4 building sites left! These sites range from single family homes to multi family buildings looking towards the mountains and into the forest. We can provide you with architectural plans and ideas or support you in building your dream ecological house. Our village design balances privacy with community interaction to foster a healthy neighborhood.